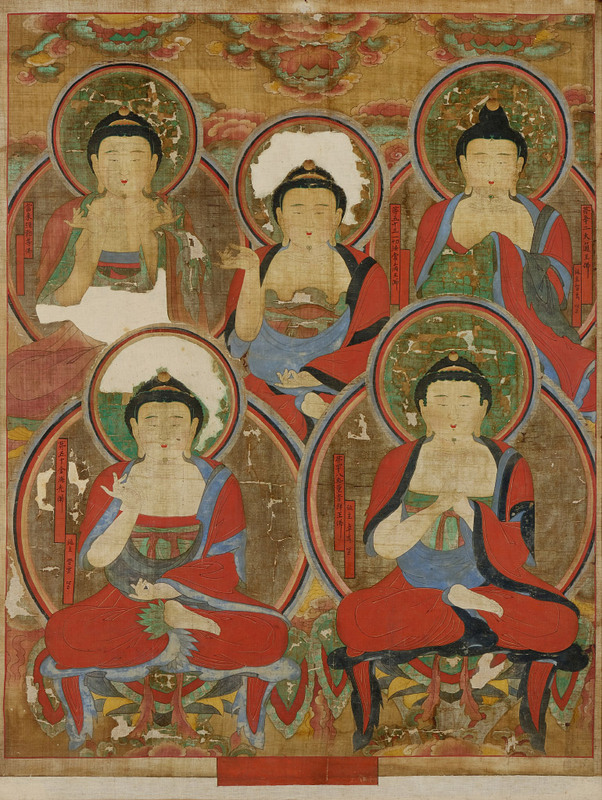 Attributed to Ui-gyeom (Korean, active late 17th/18th century), Five Buddhas, 1725, Ink and mineral pigments on hemp, Songgwangsa Monastery, Korea. Photo courtesy National Research Institute of Cultural Heritage, Korea. During the three decades when he lived in Seoul, Robert Mattielli often visited the cluster of antique shops in Mary’s Alley (Anguk-dong). One day in the early 1970s, he was browsing when a “picker” came into a shop with a cart loaded with chests. The shop owner bought the cartload. Mattielli was looking over one of the chests and noticed a tattered and folded painting inside. A few weeks later he came back, hoping to buy the chest, but it had already been sold. The painting, however, had been tossed in a back corner of the shop with packing boxes and cleaning supplies. Mattielli unfolded it and saw that it was a depiction of Five Buddhas. In those days, many temples were refurbishing their worship halls, and Buddhist paintings often appeared on the market. This one was falling apart, but he thought that it might be salvageable, if only in fragments. The shop owner said he could have it for 10 dollars. Mattielli took the painting to Ki Jung-myon, a well-known restorer whom he often engaged to repair and remount paintings. Mr. Ki argued against cutting up the painting, even though there were large areas of loss. He flattened and cleaned the painting, and framed it as it is seen today. For many years, the painting adorned the dining room of the Mattielli home in Seoul, where it was seen by a large circle of friends, both Korean and foreign. When Robert Mattielli and his wife, Sandra, moved back to Oregon in 1985, the Five Buddhas traveled with them. Robert and Sandra Mattielli have been passionate advocates for Korean art here in Portland, donating outstanding paintings, ceramics, and craftworks to the Museum. In the summer of 2014, they approached the Museum about donating the Five Buddhas—just in time for the painting to be examined by a team of visiting scholars from the Korean National Research Institute for Cultural Heritage. NRICH was conducting a survey of the Museum’s holdings with a plan to publish a bilingual catalogue. Several months later, NRICH reported their discovery that the Five Buddhas painting has been stolen from Songgwangsa, a famous Zen temple located in the mountains in the southwestern part of Korea, sometime in the early 1970s. The news was a stunning surprise, and the Mattiellis quickly offered to repatriate the painting to Korea. At the Museum’s suggestion, it was agreed to do so after a special exhibition and symposium, so that American audiences could view and learn about this exceptional work. The Museum is grateful to the Korean Cultural Heritage Administration for sponsoring this project. A special symposium on the Five Buddhas will take place at the Museum on December 3, 2016, 1–4 p.m. Following the symposium, there will be a celebratory dinner honoring Robert and Sandra Matteli, noted patrons of Korean art at the Museum.